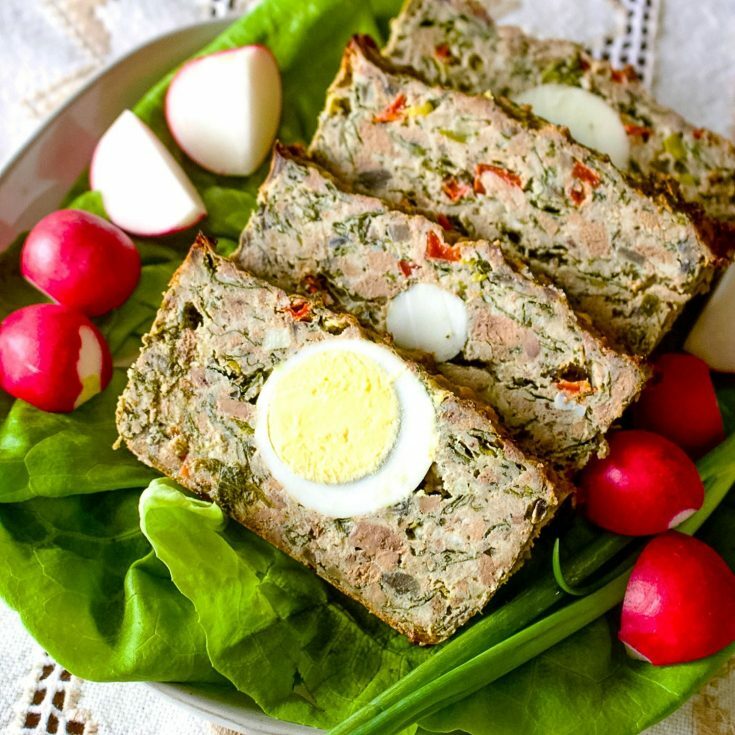 There are many traditional dishes that Romanians make for Easter, but this Romanian Easter Meatloaf-Drob de Carne Tocata cu Legume is one of the best ones you can find out there. The recipe is a version of Easter meatloaf that is made for the ones who do not like lamb or do not like organs. 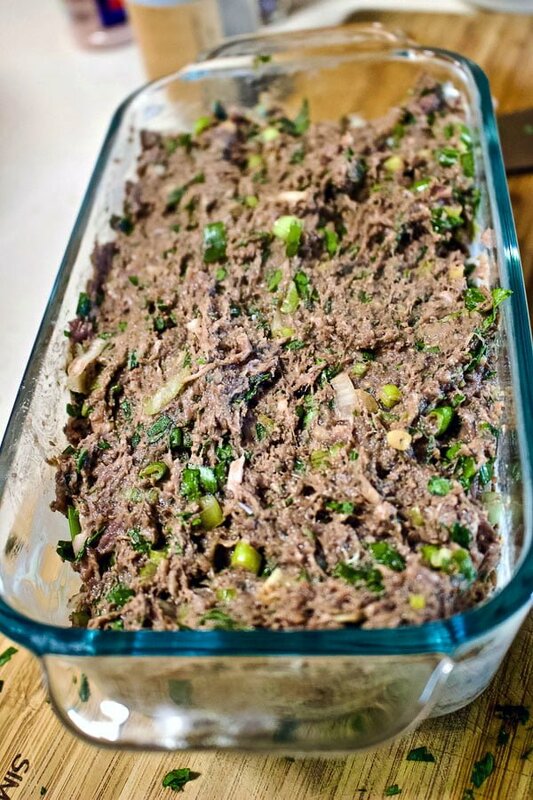 The traditional meatloaf for Easter is made with lamb organs, like liver, lungs, kidney and spleen. 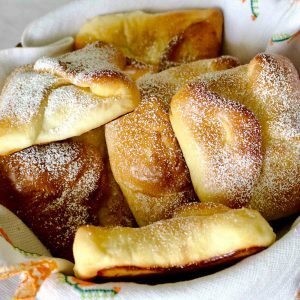 I like the original recipe and if I happen to visit my family in Romania during Easter time, I really enjoy eating it. However, here in the States, finding organs can be a challenge, and I noticed that many people do not like eating them either. If you are one of them, my friend, you are not alone. Following the recipe as I tell you, you should end up with a beautiful dish that can be consumed warm or cold. 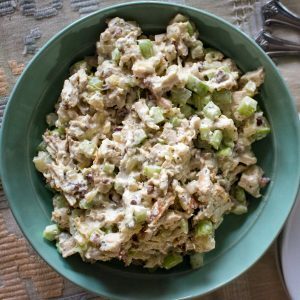 It makes a great appetizer on Easter day and leftovers are awesome as well. We usually eat this meatloaf cold, served on platters that are decorated with fresh vegetables, like lettuce, radishes, green onions, cherry tomatoes etc. We also serve them together with colored Easter eggs, slices of Feta cheese, vegetables and many other things. We are going kind of crazy when it comes to holidays and celebrations because we love to spend the time eating and drinking with family and friends. I heard some Romanians complaining about this type of meatloaf recipe to be dry and crumbly. 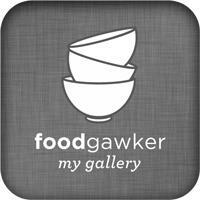 The reason it comes out like that, my friends, is the lack of fat in your mixture. 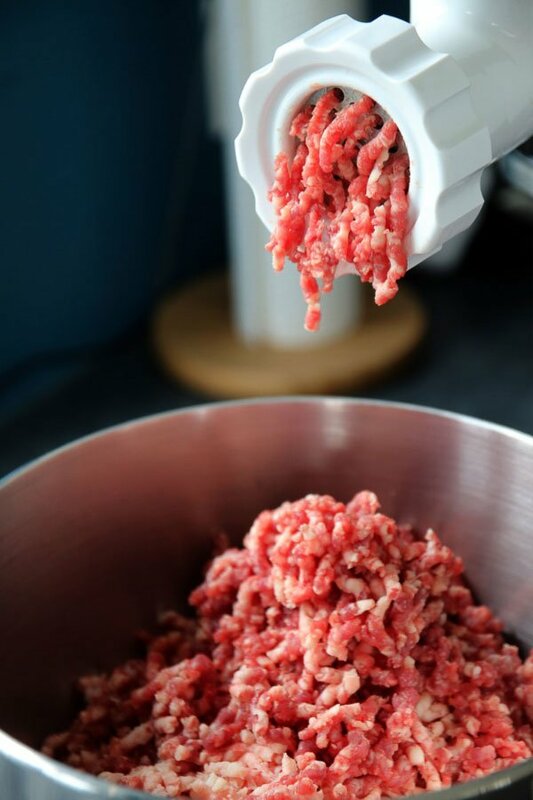 I personally prefer to mix ground beef with ground pork, because the pork has more fat, while the beef has less, so they balance each other really well. I also use a bunch of vegetables and greens, because Easter is also the symbol of Spring and eating fresh foods in season is good for you. 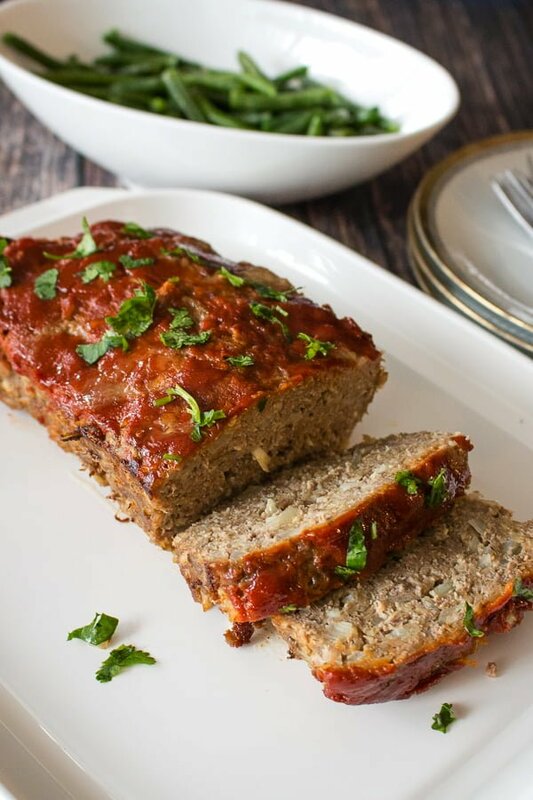 This meatloaf is not your American traditional meatloaf that you might turn your face away from. I have a recipe here that might change your mind, by the way. 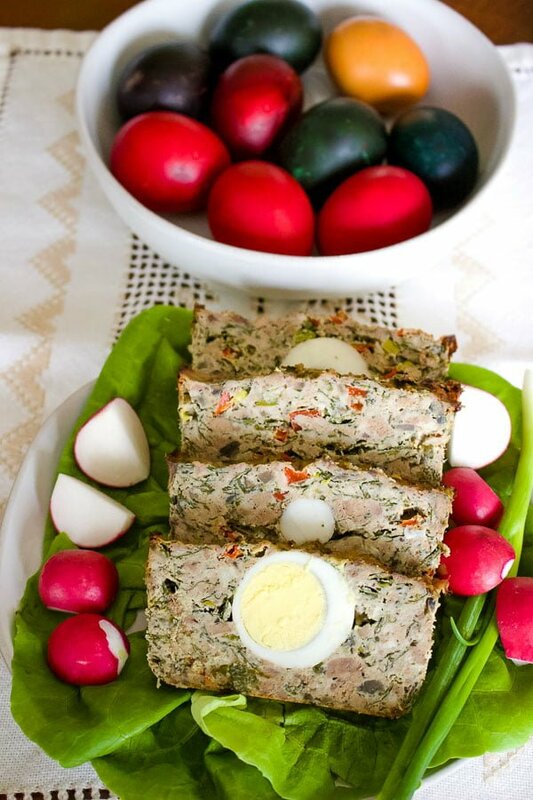 This recipe of Easter meatloaf is delicious and looks very festive, as the element of surprise inside is the hard boil egg. Yes, the meatloaf is baked with hard boil eggs that are placed inside the mixture before going in the oven. Ground meat. I call it ground meat and not hamburger meat because it could be anything you like: beef, pork, chicken or even ground turkey. My preference is half pork and half beef . 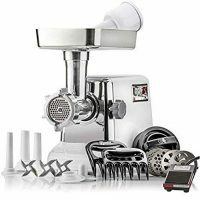 I am also kind of crazy and grind my own meat, but feel free to get good ground meat from a reliable source. 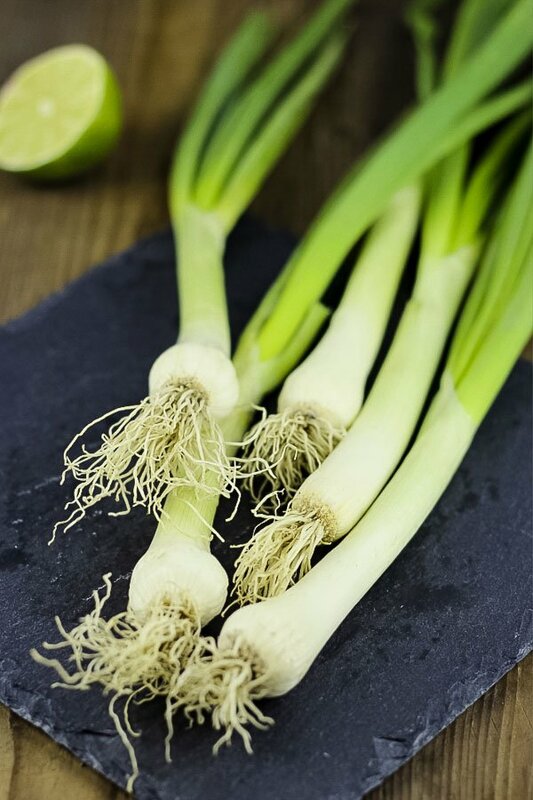 Green Onions– These are for me the symbol of Spring when it comes to cooking. They have a mild flavor and color the dish beautifully. Chop them small for this dish. 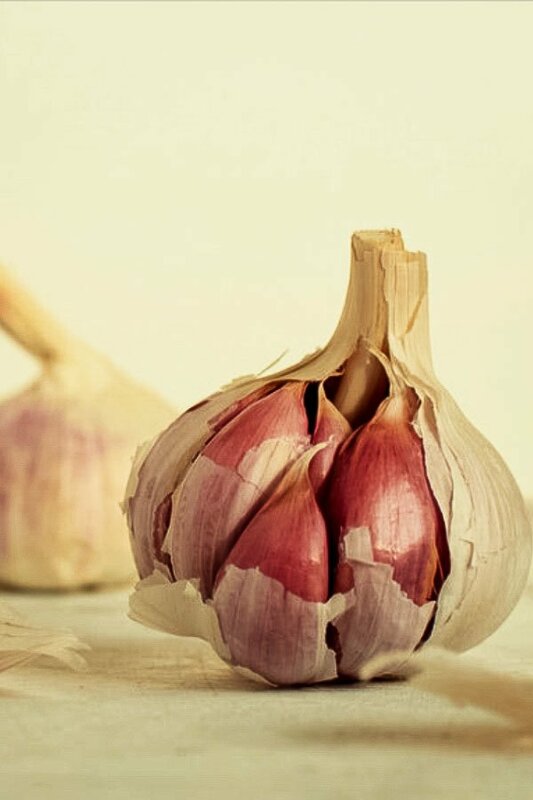 Garlic- few cloves of garlic should be enough, unless you can find the green garlic, that looks like a green onion but the leaves are flat and thin, compared to green onions that have a tubular leaf. Mince the garlic if you use regular cloves, chop it if you use green garlic. 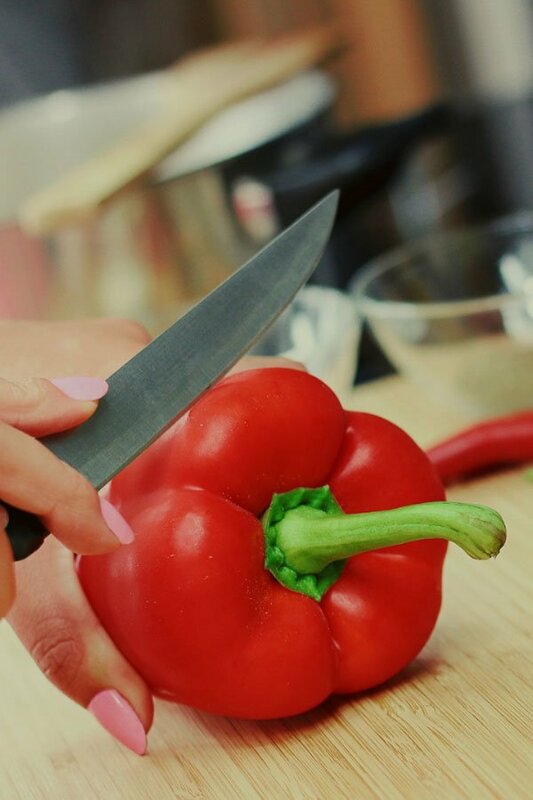 Red Bell Pepper– it is sweet, delicious and beautiful in the meatloaf. Chop it really small. 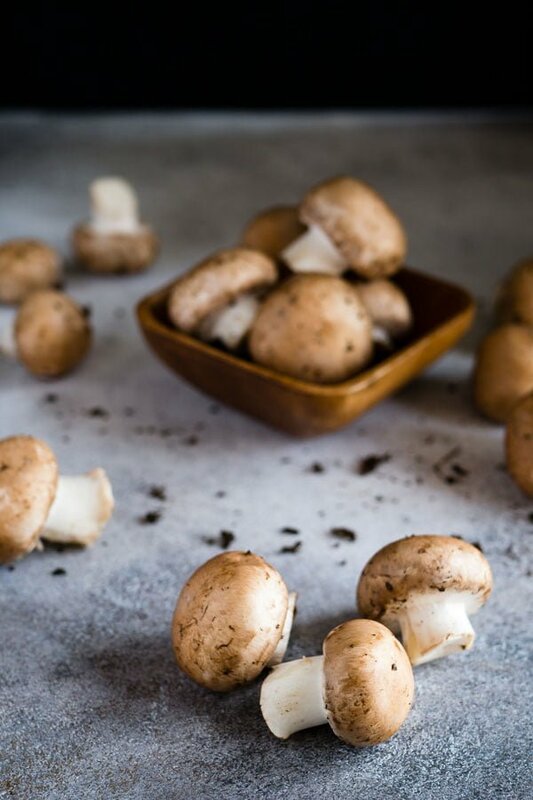 Mushrooms– They are delicious in this dish and give the meatloaf texture and flavor. Make sure you wash the mushrooms before using them(sand and dirt in the meatloaf don’t taste good). Also, dry them on paper towels or a clean kitchen towel and chop them small. 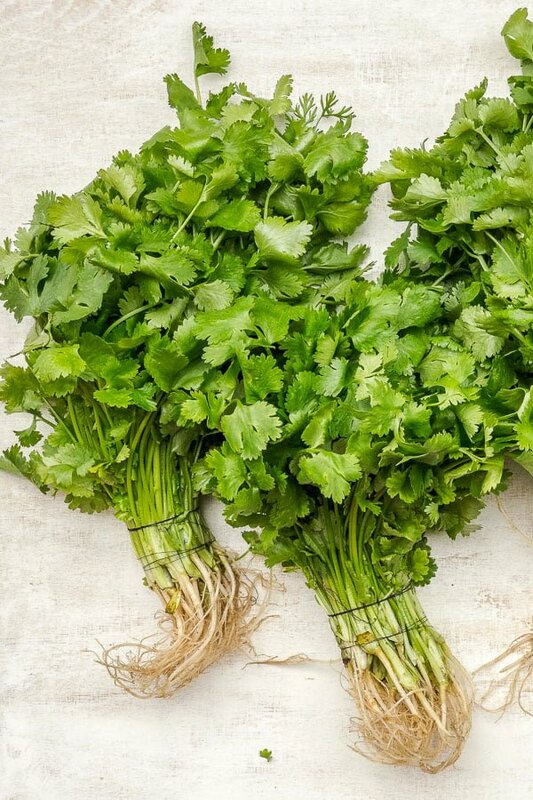 Fresh Parsley and Dill– I recommend them in a fresh form, not dry. The recipe looks and tastes better with fresh herbs. 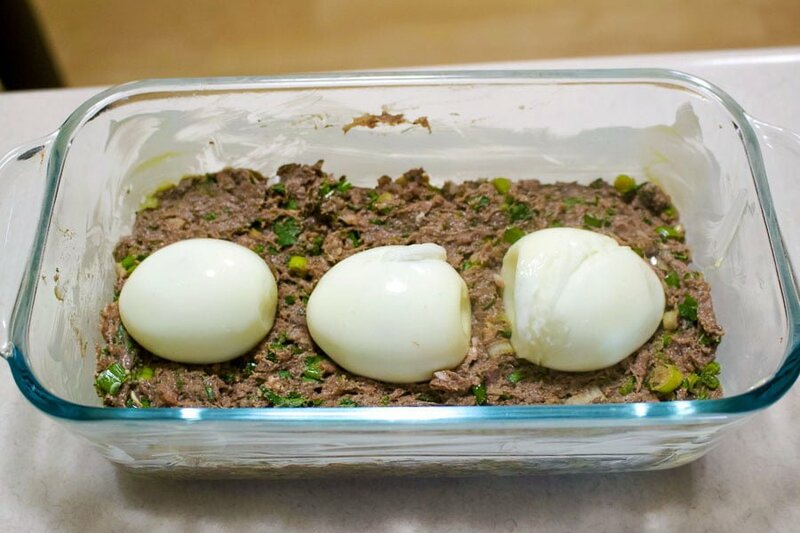 Eggs– You will need 2 large eggs for the mixture and 3-4 large eggs that will be boiled, peeled and placed in the middle of the meatloaf before it goes in the oven. Nutmeg, salt and pepper to season the meat mixture and some butter to coat the baking dish. 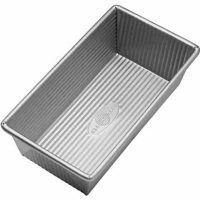 Because I baked in a glass loaf pan I did not coat the bottom of it with bread crumbs, but you can do that if you chose a metal pan. Now that you have all the ingredients, grab a big bowl. 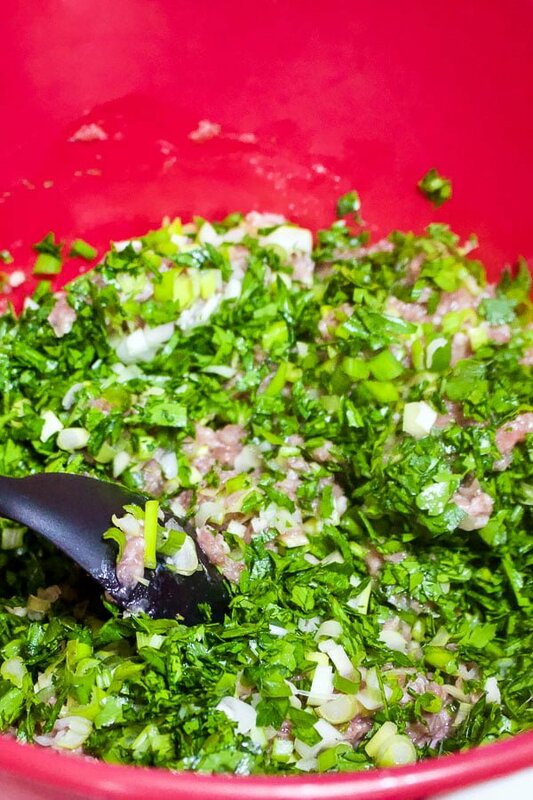 Place the ground meat in the bowl and start chopping the rest of the ingredients. 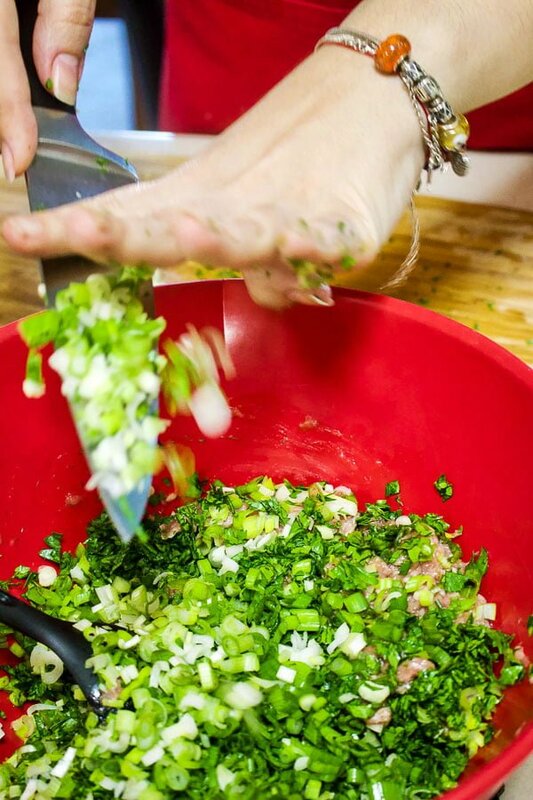 Green onions, garlic, red pepper, mushrooms, herbs, everything goes in the bowl with the meat. 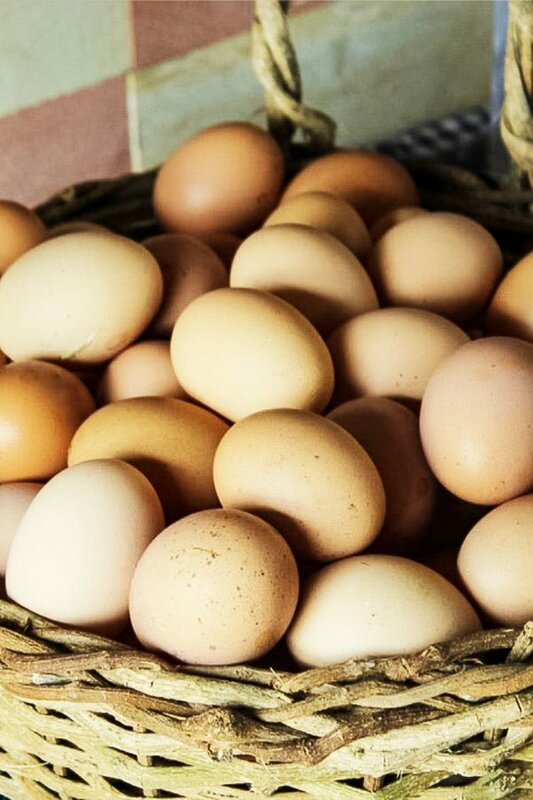 While you chop the vegetables, boil the eggs in a pot with water for 6 to 10 minutes. They don’t need to be super hard, because we will hide them in the meatloaf and they will cook again. Beat 2 eggs and add them to the meat mixture. Add salt, pepper, nutmeg. 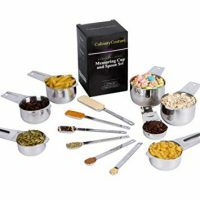 Using a wood spoon or your awesome clean hands, mix the ingredients together to obtain a cohesive mixture. 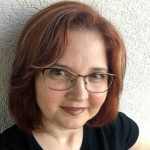 The pictures are not that awesome, but as you can imagine, my hands were kind of busy. 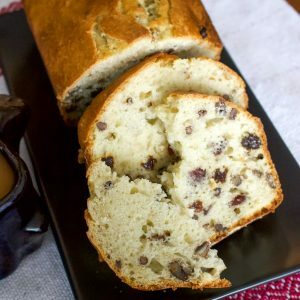 Grab a loaf pan and butter the bottom and inside walls. 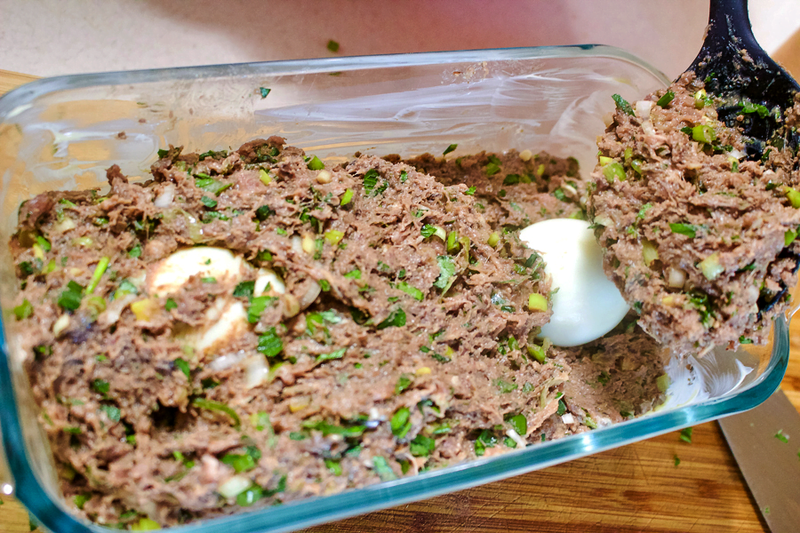 Spoon about 1/3 of the meat mixture into the pan and add the peeled eggs one by one. Come with the rest of mixture and spoon it over the eggs the best you can. They should sit nicely covered in the middle of the pan. If you want, shave few flakes of butter and place them on top of the mixture. This is optional. Use your judgment, especially if you know that the ground meat you used did not have a lot of fat. Bake at 350F/180C for about 45 minutes to maximum an hour. Time is relative, as each oven is different, each household uses a different type of pan. The glass pans need less time in the oven while the metal ones need more. Set the time for 45 minutes and see from there. Bake until the surface is nicely browned. Remove from the oven and let the meatloaf cool down. 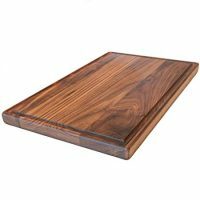 Ideally, you can put it in the fridge for few hours or until the next day when you can gently run a knife around the edges and remove the meatloaf from the pan easily on a platter. This meatloaf is served cold as an appetizer placed on plates decorated with fresh lettuce leaves, radishes and green onions. Mustard and mayo can accompany the dish together with colored eggs, cold cuts and cheese. Just look how pretty it is and how easy the recipe is. 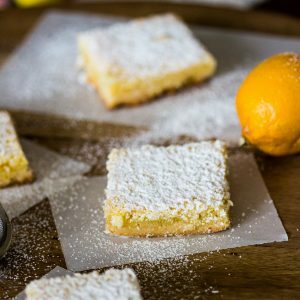 Interested in other recipe ideas for Easter? Here you have a collection of my favorite ones that I like to make almost every year. 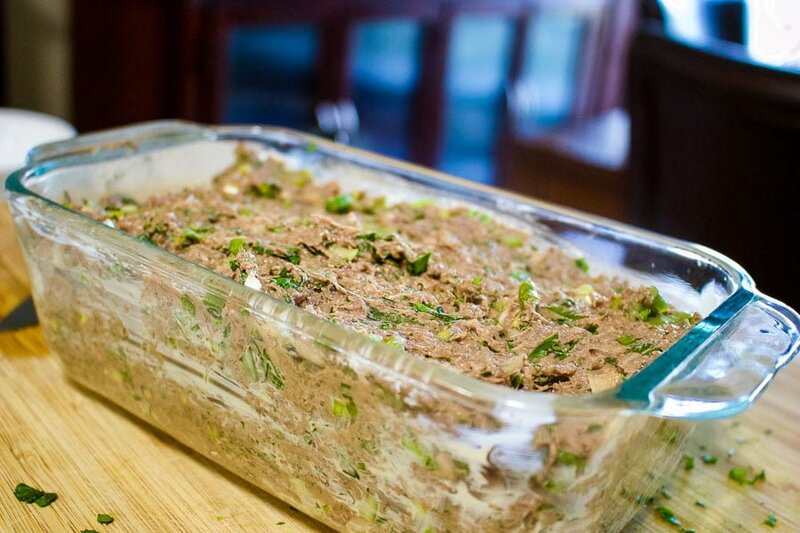 I hope you try this Romanian Easter Meatloaf recipe! 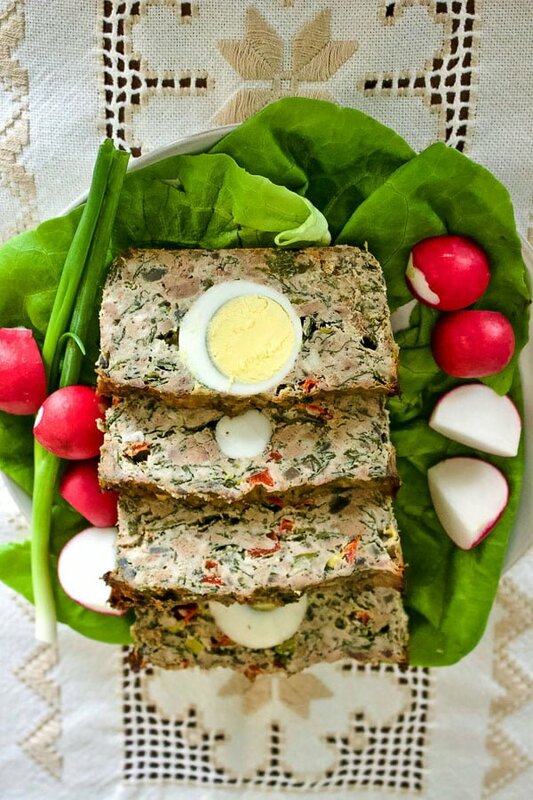 There are many traditional dishes that Romanians make for Easter, but this Romanian Easter Meatloaf is one of the best ones you can find out there. Boil 3-4 eggs in a pot with water for about 6 to 10 minutes. Cool and peel the eggs. Set aside. 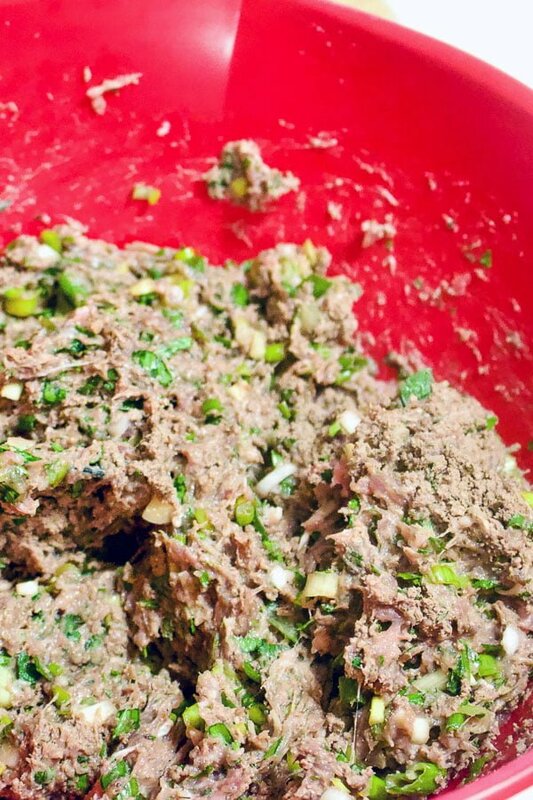 In a large bowl place the ground meat. Chop the green onion, garlic, red bell pepper, mushrooms, parsley and dill. Add all the vegetables and herbs to the meat. Beat 2 eggs and add them to the mixture. Add salt, pepper and nutmeg. Mix until all ingredients are well incorporated. Butter a loaf pan and coat with bread crumbs. 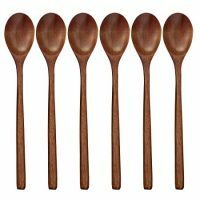 Spoon about 1/3 of the meat mixture in the baking pan and press it with a spoon until it's compact. Place the eggs on top of the meat and cover them with the rest of the mixture making sure it is evenly distributed. Optional, if you know that the meat doesn't have a lot of fat, add few small pieces of butter on top of the mixture. Bake the meatloaf at 350F/180C from 45 to 60 minutes. Set the time at 45 minutes and check from there. The meatloaf should be nicely browned on top and a toothpick should come out clean when you test the meatloaf in the middle. 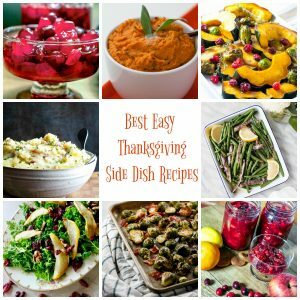 It might take a little bit longer than 45 minutes, depending on your oven and the pan material. Let it cool in the pan, place it in the refrigerator to set for few hours or until next day. 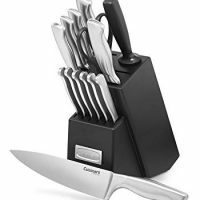 Next day, run a knife around the edges and remove the meatloaf on a platter decorated with fresh lettuce leaves, green onions and radishes. 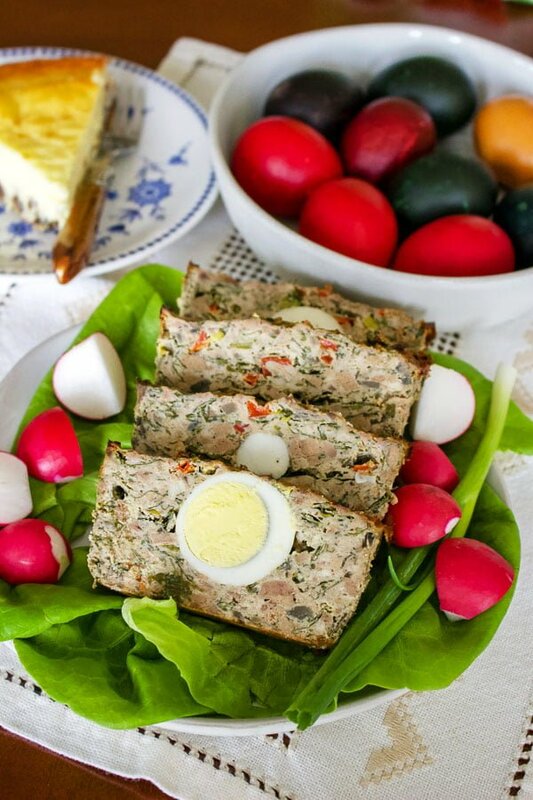 Serve cold as appetizer with Easter colored eggs, salads, cold cuts and cheese. Mustard and mayo are good as well with it.